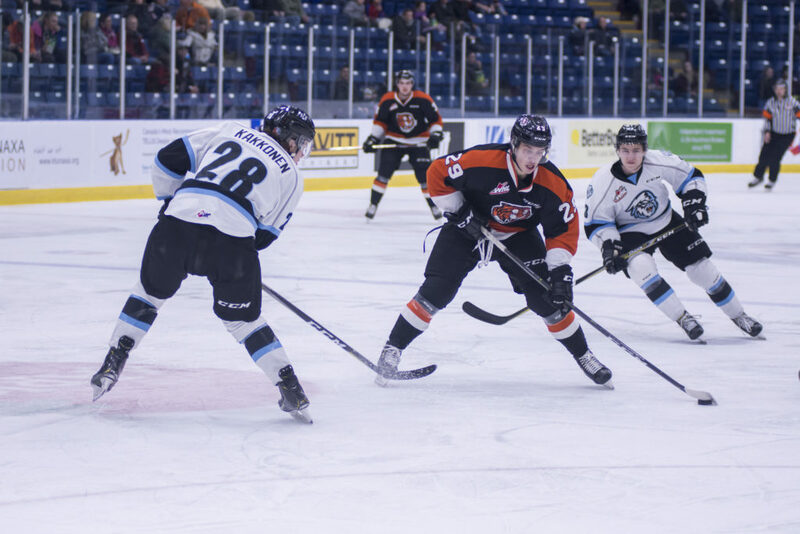 Medicine Hat, AB — The Medicine Hat Tigers opened their four-game road trip with a 6-3 victory over the Kootenay ICE. The ICE tied the game up at 3 apiece early in the final frame before Ryan Jevne powered the Tigers to victory by scoring 18 seconds later. The Tigers’ veteran forward was involved in all three of the Tabbies’ third period goals while he had a 4 point (2G, 2A) night. The ICE struck first when Brad Ginnell scored from the point on a power play midway through the opening period. Ryan Chyzowski responded for the Tigers, scoring 8 seconds into a Tigers’ power play. Jevne and James Hamblin combined on the play. With less than a minute to play in the first period, Brett Kemp fed the puck to Cole Clayton who fired it in from the point to give the Orange and Black a 2-1 lead. Corson Hopwo also assisted on Clayton’s fourth goal of the season. ICE Captain Peyton Krebs was called for slashing at the end of the first period and the Tabbies opened the second stanza on a power play. Clayton combined with Bryan Lockner to set up Tyler Preziuso to score with 8 seconds left on the power play. Preziuso’s goal was his 18th of the season. Late in the period, Krebs responded for the ICE, cutting the Tigers’ lead and making it a 3-2 hockey game. ICE forward Jakin Smallwood scored early into the final frame to tie the game up 3-3. Twenty-four seconds later, Jevne regained the lead for the Tabbies by beating Makaj blocker side to score his first of the night. Hamblin and Preziuso assisted on the play. Late in the game, while on a four-minute power play, Jevne combined with Linus Nassen to set up Chyzowski for his second of the night and 18th of the season. With 1:20 remaining in regulation, ICE called a timeout. Makaj left his net to give his team an extra attacker while the faceoff was to the right of Mads Søgaard. Preziuso won possession of the puck and played it ahead to Jevne who skated it down the ice to score his 23rd goal of the season on the empty net and seal the 6-3 victory. Søgaard turned aside 23 of 26 shots faced while Makaj stopped 46 of the Tigers’ 51 shots. The Orange and Black are now 29-18-2-2 and will travel to Everett Friday to face the Silvertips for the second game of their four-game road trip.